PerryGolf is delighted to offer an exceptional cruise for a fortunate few to some of the most beautiful islands of the Mediterranean on board the utterly exclusive mega-yacht SeaDream II. Our specially crafted itinerary visits some of the regions and most otherwise geographically difficult to access golf courses. 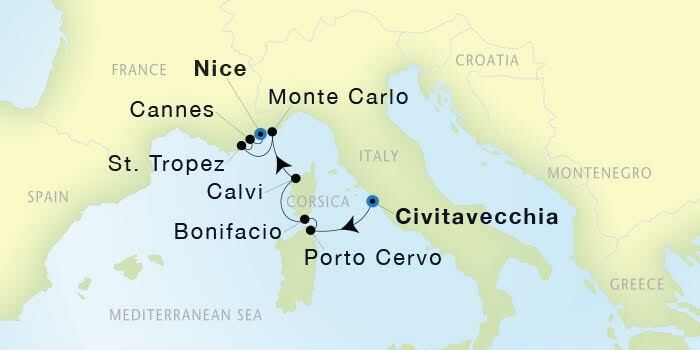 The cruise begins in Rome, Italy and concludes in Nice, France. We will visit six ports of call starting with the renowned islands of Corsica and Sardinia, followed by iconic ... Read More. Monte Carlo, before moving on to the beautiful St. Tropez and Cannes. During the course of the voyage we also offer several late evening departures, allowing guests the opportunity of exploring our destinations in more depth. The golf in our four round lineup will be sure to delight; the beautiful Pevero on Sardinia’s revered Costa Smeralda; the spectacular Sperone Golf Club on the island of Corsica with its stunning location and shoreside holes; the lovely Monte Carlo Golf Club on France’s Cote d’Azure; and finally, French Riviera Masters host Terre Blanche – Le Chateau Course. Playing this selection of courses in such ease is only made possible by having our very own mega-yacht at our disposal! The program includes greens fees and cart fees and will of course be fully managed by PerryGolf from tee times and pairings to golf equipment handling and ground transportation all completely arranged. Carrying a maximum of just 112 guests, with an award winning crew of 95, the yachts of SeaDream are consistently ranked among the finest in the small ship category by all the definitive cruise guides. Quality of service and outstanding dining are SeaDream hallmarks. The experience is entirely all-inclusive, with dining, boutique wines, open bar, and gratuities covered. Another highlight of the week is sure to be SeaDream’s fabulous onboard spa, fully accredited by the Thai Spa Association. “Mediterrean Islands Golf Cruise by Mega-Yacht 2018 ” offers a great opportunity to experience one of the world’s most beautiful areas on board a truly special mega-yacht. We hope you will join us! Embark SeaDream II from 2:00PM. All aboard 4:00PM. The port of Civitavecchia is the gateway to Rome, whose incredible history spans over 2,500 years. Rome’s historic center is listed by UNESCO as a World Heritage Site. St. Peter’s Basilica, the Sistine Chapel, Trevi Fountain, the Vatican Museums, the Borghese Gallery and the Coliseum are only a few sight found in the Eternal City that are among the most visited in the world. The beautiful Porto Cervo nestles in the northeast corner of the island of Sardinia in an area known as Costa Smeralda (Emerald coast). The village is the main center of Costa Smeralda. It was created by Prince Karim Aga Khan and various other investors with the village housing some excellent boutiques, bars and restaurants. Enjoy it on your own or by a SeaDream Land Adventure®. GOLF: Today play the Pevero Golf Club, Sardinia’s first golf course opened in 1972 and designed by Robert Trent Jones. It’s found along the edge of a rugged, jagged coastline in chic Costa Smeralda sandwiched spectacularly between the Gulf of Pevero and the sparkling bay of Cala di Volpe. The outward half plays counter-clockwise; the inward clockwise. While the coastline is never in play, Jones has added several ponds to make water an ever-present danger plus he has wisely afforded generous landing areas so that the course is enjoyable even when confronted by the area’s famed north wind – the Mistral. We will spend this evening in port until 1:00AM for your additional enjoyment of Porto Cervo. The ancient fortress town of Bonifacio is Corsica’s star attraction, drawing visitors to marvel at its medieval houses precariously teetering on the edge of the imposing limestone cliffs. Bonifacio's Old Town, with a labyrinth of narrow streets and historic buildings, was built by the Genoese and is a fascinating place to wander around. Founded in 828 AD by Count Bonifacio of Tuscany, it's natural harbor bears a striking resemblance to the home of the Laestrygonians referred to in Homer's Odyssey of the 7th century BC. Bonifacio also boasts a busy marina filled with impressive yachts and lined with chic bars, restaurants and hotels, enhancing the vibrancy of this fashionable coastal resort. GOLF: Sperone Golf Club Today you will play where Napoléon Bonaparte was born, in Corsica on a Cabell B. Robinson (for Robert Trent Jones) design opened in 1990 that many have called Europe’s Pebble Beach or Cypress Point. In several very memorable spots, Sperone Golf Club is that good. The solid front nine winds through rugged Corsican undergrowth to a number of small raised greens. It’s a short course so you’ll manage but the back nine packs a punch. Eleven plays down toward the ocean and a slender ledge green sandwiched between large boulders. Twelve is a testy 3 par across a rocky canyon to an elevated cliff-top green. Planet Golf says both the 15th and 16th would be all-world holes with a little tree clearing. We suspect you’ll be impressed nonetheless. Calvi, a commune in the Haute-Corse region of France, is located on the northwest of Corsica. Locals maintain that Calvi is the birthplace of Christopher Columbus…validated by the fact his house can still be visited – or at least its ruins can! Legend upholds that Nelson raised it to the ground at the time of the French garrison bombardment in 1794. Nowadays, Calvi attracts wealthy yacht-owners who sail from Nice and Cannes to enjoy an awe-inspiring view of the citadel. Located in Balangne are unblemished mountain villages which offer splendid olive oil, wine and cheese. Monte Carlo epitomizes the French Rivera, it is famous for being famous. This is where you’ll find the Casino de Monte Carlo which was center stage for 007s first visit to Monaco in Never Say Never Again and a sight to behold from the outside as well as in. It is home since 1929 to the Monaco Grand Prix, considered to be one of the most demanding Formula One circuits of the season due to its insanely narrow streets with tight corners and elevation changes. There is also Monaco Cathedral, the Napoleon Museum, the Oceanographic Museum and the Prince's Palace where Prince Rainier III and his wife Grace Kelly began their restoration of Monaco with his accession to the throne in 1949. One of the best views you’ll find is from Vista Palace Hotel and be sure to have a drink in Le Bar Américain at Hotel de Paris. You can't find a bar with better service and the Hotel is truly one of the best in the world. If you want to spend money on dinner, the restaurant Le Louis XV has 3 stars in the Michelin guide and a wine cellar with 400,000 bottles. Appropriately enough all the hands on the clocks are stopped on 12 as a reminder that inside this Palace of Pleasure, time is of no consequence. GOLF: Today play The Monte-Carlo Golf Club designed by Willie Park, Jr. opened in 1911. It offers an 18-hole golf course in an idyllic setting between the sea and the mountains! The golf course, located in La Turbie (in the heights of Nice), has a rolling terrain that requires extreme precision. Discover an elegant club in a warm and friendly ambience! We will spend this evening in port until 11:59PM for your additional enjoyment of Monte Carlo. Brigitte Bardot is credited with putting St Tropez on the map with her 1956 film And God Created Woman. Mick Jagger added swagger in 1971 when he married at Chapelle Ste-Anne, a small Provençal-style chapel built in 1618 on a hilltop overlooking the Place des Lices. This is where the champagne craving world comes play. Where you can always find the most astounding yachts, the most astounding yacht parties, provocative beaches and the most outrageous night clubs like Les Caves du Roy. There is yet a serene side to this fishing village which you’ll be able to appreciate in advance of the summer apex meaning a meander along the cobbled lanes in the old fishing quarter of La Ponche. Sipping pastis or a rare rosé at a Place des Lices café. Walking along the coastal path. Be sure to sample the town’s namesake cake, La Tarte Tropezienne. The keepsake to bring home is a pair of Rondini Sandals. They can be purchased on line but why would you want to miss the opportunity of running in to almost anybody in their store? We will spend this evening in port until 11:59PM for your additional enjoyment of St. Tropez. Cannes is a former fishing village in southern France turned international hotspot for the jet set particularly each year in May. Pack your Dolce & Gabbana’s, the Cannes Film Festival shines a dazzling light on this town unlike any you’ve ever seen. There will be no shortage of actors, celebrities and directors on the famous steps of the Palais des Festivals but don’t short-change this visit. Make your way to Le Suquet, the old quarter of Cannes famous for its winding cobbled streets lined with local restaurants. A selfie from the clock tower looking over the Bay of Cannes and the city will look smashing on your Facebook page. Options just out of town include Grasse where you can create your own perfume and historic St. Paul de Vence, one of the oldest medieval towns on the French Riviera known for its modern and contemporary art museums and galleries. GOLF: Only 20 minutes from Cannes is the five star Terre Blanche Hotel Spa Golf Resort where you will play the more challenging of their two courses, Le Château. Billionaire German businessman Dietmar Hopp, one of the SAP AG founders, gave former Ryder Cup golfer turned architect Dave Thomas a spectacular 300 hectare site and a healthy budget to do something special and he has. Le Château winds through pine and oak clad hills and valleys providing sweeping panoramas of neighboring Provence villages and the Southern Alps. It is immaculately maintained and most recently rated as the 14th best club in continental Europe. Terre Blanche Hotel Spa Golf Resort Billionaire German businessman Dietmar Hopp, one of the SAP AG founders, gave former Ryder Cup golfer turned architect Dave Thomas a spectacular 300 hectare site and a healthy budget to do something special and he has. Le Château winds through pine and oak clad hills and valleys providing sweeping panoramas of neighboring Provence villages and the Southern Alps. It is immaculately maintained and most recently rated as the 14th best club in continental Europe. Pevero Golf Club Sardinia's first golf course opened in 1972 and designed by Robert Trent Jones. It’s found along the edge of a rugged, jagged coastline in chic Costa Smeralda sandwiched spectacularly between the Gulf of Pevero and the sparkling bay of Cala di Volpe. The outward half plays counter-clockwise; the inward clockwise. While the coastline is never in play, Jones has added several ponds to make water an ever-present danger plus he has wisely afforded generous landing areas so that the course is enjoyable even when confronted by the area’s famed north wind – the Mistral. Only 20 minutes from Cannes is the five star Terre Blanche Hotel Spa Golf Resort. Billionaire German businessman Dietmar Hopp, one of the SAP AG founders, gave former Ryder Cup golfer turned architect Dave Thomas a spectacular 300 hectare site and a healthy budget to do something special and he has. Le Château winds through pine and oak clad hills and valleys providing sweeping panoramas of neighboring Provence villages and the Southern Alps. It is immaculately maintained and most recently rated as the 14th best club in continental Europe. Our “Book Today” prices are capacity controlled and may change without notice until booked. The fares are per person based on double occupancy. Single and third person rates are also available. Call 1.800.344.5257 to consult with a PerryGolf Travel Expert. Greens fees for four (4) rounds of golf including shared use of electric golf cart where available.